The Volkswagen ID Buzz concept is to go into production, it has been announced. 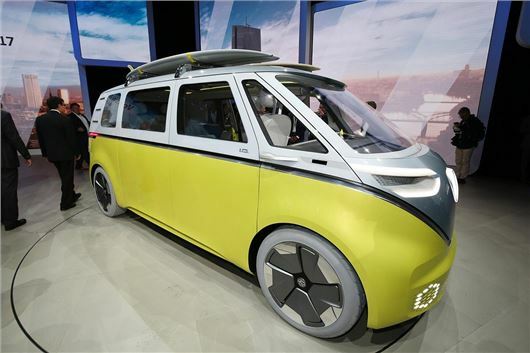 The electric MPV takes many styling cues from the famous Volkswagen Type 2 Microbus, introduced in the 1950s, but with a thoroughly modern, all-electric powertrain. While its inspiration might have been a van with seats, the ID Buzz is more of an MPV, designed specifically for transporting people from the outset. Since it’s an EV, there’s no need to fit an engine or transmission – instead there only needs to be space for a battery pack and compact electric motors. The result is plenty of interior space – so the concept version is an eight-seater. It has a very neat interior design with lots of bright shades – which aren’t exactly family-friendly. So we imagine the production car will use darker colours and typical Volkswagen materials. Other concept car details like 22-inch wheels and a steering wheel that retracts into the dashboard when autonomous driving is engaged are unlikely to make production either. But even so, the basic shape and style should make it to the showroom. When? Probably in 2022, so there’s a lot of time left to speculate about price and technology.